This guardian of digital history is archiving whatever he can get his hands on. Digital historian Jason Scott has an eclectic portfolio. At Textfiles.com, he collects files and related materials from the era of dial-up bulletin-board systems. That work led him to create BBS: The Documentary, an eight-episode miniseries about the early history of online culture. 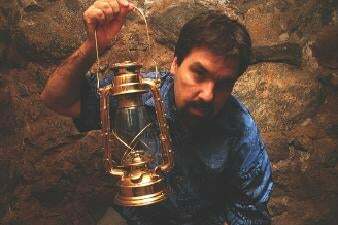 His second documentary, Get Lamp, set to debut this week, examines text adventure games through interviews with developers, designers and players. Even if you've never heard of Scott, you might have heard of his cat: Sockington, the most-followed animal on Twitter, has more than 1.5 million followers. Favorite text adventure game: Colossal Cave, a.k.a. Adventure, the original text adventure game by Will Crowther and Don Woods. I'd do anything but: Destroy history. What most people don't know about me: I wore a cow suit in Harvard Square [in Cambridge, Mass.] and drew caricatures until new state laws made it too expensive. How would you describe text adventures? I think of a text adventure as a computer game with a text interface that describes a location and asks you to type in what you should do next. If someone reads it to you, can you still [understand what's going on]? If you can, it's a text adventure. If you can't, then it's a graphic video game. Text adventures are no longer a financially viable form of entertainment. What caused them to fade into history? The idea of exploring a world, trying to figure out the meaning of that world, pull out answers from it and solve a quest was readily taken over by graphic adventures. These companies didn't ask how they could improve text adventures, so they lost money and got bought out. Where can we find influences of text adventures today? Everything in which you are presented with a quest and must figure out -- through skill, wit or luck -- what you are there for, what you need to do and how to do it is a descendant of text adventures. A lot of what we consider "sandbox" games, like Grand Theft Auto, are good examples. If you look at text adventure contemporaries, you find games in which you can turn in four directions and shoot at a ship. Compare that to one that gives you a description, asks you what you want to do next, and you can type anything. That's what made them so innovative for their time. It was a completely foreign and mythical idea. Your Web site, Textfiles.com, preserves and publishes historical content. How do you balance respecting copyrights and preserving history? I generally violate the copyrights of obscure material whose pedigree is lost or which obviously was never part of a money-making entity. The core of a lot of my stuff comes from an era when it was impossible to track back the origin.